‘s-Hertogenbosch, also called ‘Den Bosch’, is the capital city of the province North Brabant in the Netherlands. The city has a a lot of historical buildings and monuments with a diversity in architectural style which is clearly identified on the outside of the buildings. We see the Gothic cathedral with its Romanesque towers, neo-Gothic buildings and Dutch Classicism. When walking through the city you will surely be impressed and agree that it has it’s own unique feeling. A wonderful city to walk around in and enjoy the view, shopping, parks and the range of activities. There are a lot of parking opportunities in the city, as well indoor as outdoor. The parking spots are well indicated in the city and most of the times it is also indicated how many spots are still available. Just follow the signs. On any parking spot I would suggest not to leave any valuable items in sight inside of the car. Den Bosch is centrally located and is easily reachable by as well public transportation as by car. Although the highways offer a good connection to Den Bosch from all direction, it should be noted that on peak hours you can expect traffic jams. Peak hours are on workdays in the early morning (around 8:30) and in the late afternoon and evening (starting at about 5pm). If possible it might be wise to avoid these hours to ensure quick entry in the city. Suggested method of travel once inside the city is by foot. All locations are easily accessible by foot and the city is very pedestrian friendly. There are sidewalks everywhere and the center also has pedestrian only shopping area’s. If your covering more ground it might be an idea to rent a bike. The city is cycle friendly and there are enough options to stall, as well secured as unsecured, your bike. The complete innercity is also connected through a good web of bus lines, so when your a little exhausted a bus stop is always nearby. If your going to travel to the Netherlands by plane, the largest airport to travel to is Schiphol Airport in Amsterdam. It is served by most airlines in the world and will have direct connection from many countries. When arriving at Schiphol Airport, you have a direct train connection to Den Bosch right from the airport. Another possibility would be to rent a car at one of the rental providers on site. There are two other airports you might consider: Rotterdam Airport and Eindhoven Airport. Both are served by budget providers like Ryanair and flights arrive from various locations. As these are smaller airports you’d have to check first if there are flights possible from your departing location. Both airports have good public transportation connections with Den Bosch, you might have to use a bus as well as a train. Den Bosch is served by the railway provider ‘Nederlandse Spoorwegen’ and as good as every city in the Holland has a great connection to it, at most you’d have a single stopover but most connections are direct. Also travelling by train has it’s peak hours in the morning and evening on workdays. On the Central Station there are busses available that will easily get you to any point within the city from where you can continue your exploration by foot. There are several taxi services available in ‘s-Hertogenbosch and if shared with multiple people it is quite affordable. As Den Bosch is one of the oldest cities in the Netherlands the city itself can be considered a tourist activity. It is quite enjoyable to walk through the city center as it houses some old and interesting buildings. For example The Moriaan the oldest brick building the Netherlands, you can find it at the market square where it houses the tourist center for the city. If your into theme parks, which most people are, I highly suggest visiting the Efteling for a day. It is certainly one of the most fun theme parks in entire Europe! Getting there is easily possible by public transportation, and by car it is only a 20 minute drive at most. Den Bosch has a lot of great restaurants and just walking around in the city you will certainly find something to your taste. 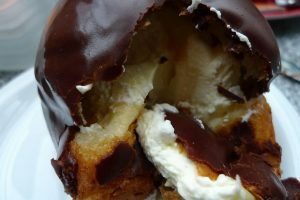 There is however one must eat sweet when your in Den Bosch and that’s called the ‘Bossche Bol’, which clearly is named after the city and originates from this city. It’s a big ball filled with whipped cream and an exterior that is coated with delicious chocolate. This pastry is normally eaten with a cup of coffee (so not really as dessert) as an in-between. And don’t worry that it gets messy, as it seems to be impossible to eat this pastry without making a mess. 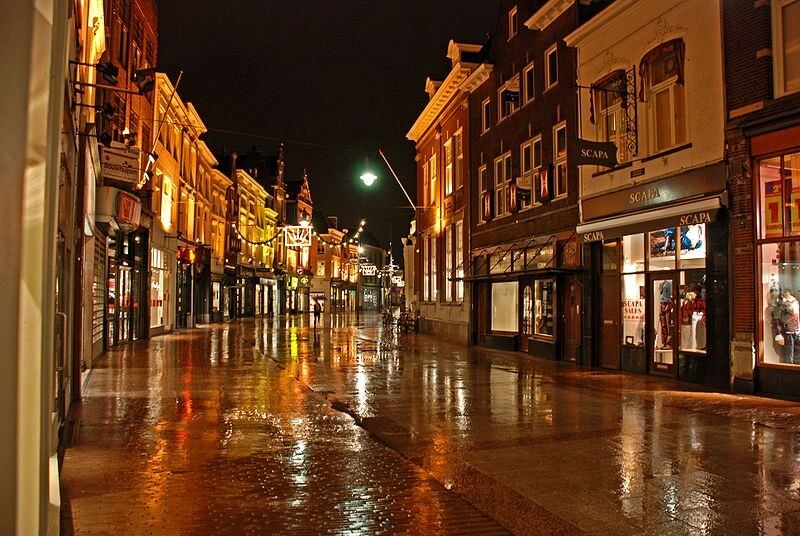 ‘s-Hertogenbosch is a charming city that not too long ago received a reward as best innercity of the Netherlands, which gives to show that you most certainly will not be disapointed with a day of shopping in this wonderful city. You’ll find all the big brands and high street retailers, but besides that many pittoresque streets with lovely specialty stores and boutiques. If your looking for shoes be sure to check out Coozi in the Vughterstraat (nr 53), they have a great collection of exclusive shoe brands for affordable prices.